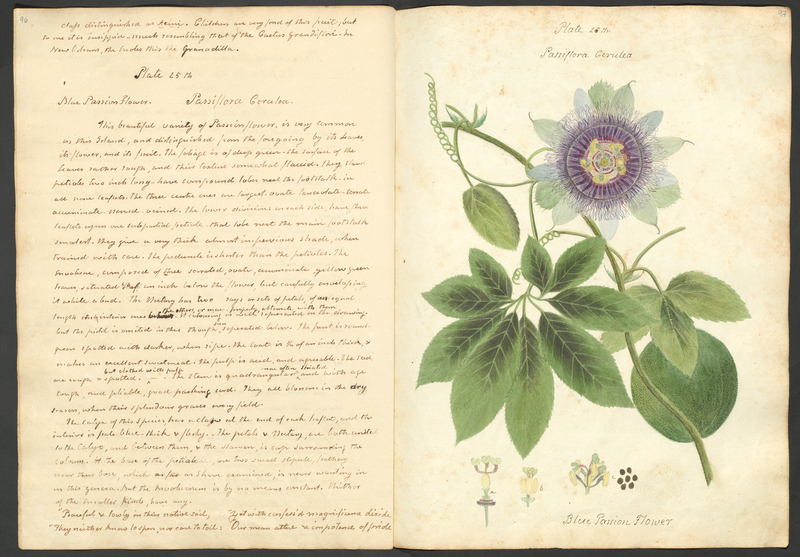 Dating back to 1826 and brimming with meticulous descriptions and vivid watercolor illustrations, Nancy Anne Kingsbury Wollstonecraft’s manuscript, Specimens of the Plants and Fruits of the Island of Cuba, never saw print in her lifetime despite her attempts at publication. Nearly two centuries later, the lush life she captured can now be admired and downloaded from HathiTrust, where it was shared by Cornell University Library. Very little is known about Wollstonecraft, said Cueto. She was born Oct. 29, 1791, in Rindge, New Hampshire, and was married to Charles Wollstonecraft, the brother of author and philosopher Mary Wollstonecraft and uncle to Mary Shelley, author of Frankenstein. Her three-volume folio—comprising 220 text pages and 121 illustrated plates —became a family heirloom and was eventually donated to RMC in 1923 by Benjamin Freeman Kingsbury, a Cornell professor and descendant of Wollstonecraft’s.